Best Garden Hose Splitter. Give the Garden a Drink! After much research and examination of the Garden Hose Y Valve Market, we have found that the best garden hose splitter is the Ipow Solid Brass Body Backyard 2 Way Y Valve. It’s a solid brass product with easy-to-operate levers, a good price, and durability. Rubber gasket O-rings are included in the package, and the price is certainly right! For more information on the Ipow hose splitter, please see our Product Reviews section below. For those who are looking for a manifold-like garden hose output system, The Sommerland A1007 4-way system provides a whopping 4 hose connections. It’s well made with the same all-brass construction found on the Ipow above and includes rubber gaskets as well. We docked it a few points for slightly awkward operation, but this is a great option for those who need a lot of outputs. For a complete review of the A1007, see our Product Reviews section below. The A1005 by Sommerland is another all-brass Y-valve that works well and comes in at a very affordable price. It should serve most gardeners well with average use. For more information on the A1005, see our Product Reviews below. Many gardeners who have large areas to water can use a hose splitter, also known as a Y-valve. They give homeowners the ability to connect and use multiple hoses on one spigot and to run garden hoses for DIY irrigation, garden soaking, and many other effective tasks. Garden Hose Splitters really open up possibilities for your watering system. You may use one hose or both hoses – or up to 4 hoses, on some of the versions we look at today. These adapters screw on to the existing faucet and give users the option of turning each outlet on or off with an individual lever. It’s like adding a whole new spigot to your yard or garden – allowing you to run a sprinkler and water your plants at the same time. It’s an easy way to double up on your efficiency and halve the time it takes you to do gardening chores that involve water. You should expect your hose splitter to work easily, not leak, and hold up to normal garden use, without breaking. Handles and attachments should work freely and be reached easily. Be sure to bring your garden hose splitter in when the weather gets chilly! When you’re ready to shut down your spigots for the season (often Daylight Savings weekend for many), be sure to bring in your hose splitter. If you leave it outside and there’s water still present in the valves, they can be damaged or destroyed by freezing and thawing. Garden Irrigation Systems allow you to run small water lines to various locations in the garden, from potted plants to garden beds to lawn areas. These systems can help you automate your gardening, especially when paired with water timers like the ones mentioned below. Find out our favorite garden irrigation systems here. Soaker hoses are simpler versions of Garden Irrigation systems and are essentially garden hoses with pinholes pricked in them, allowing water to seep out into the roots of plants, as opposed to spraying on the leaves. Generally, watering the roots is a more effective way of watering plants. Water Timers can make life much easier for the busy gardener, without much cost. These systems allow for basic automation of gardening, and some water timers act as garden hose splitters, as well. See our information on the best water timers for details. Depending on how you pair the water timer with the Y splitter, you could have a single timer trigger two outputs, or two separate timers working on each side of the Y.
Wifi water timers are more advanced than the basic hose timers mentioned above. These units are capable of being controlled by an app, and also often act as hose splitters as well. See our information on wifi water timers for further details. In this section, we’ll look in depth at five different garden hose splitters. We’ll start with a comparison table to get situated, and then move on to individual reviews of each Y Valve. Finally, we’ll conclude with our favorites. 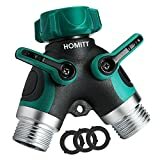 The Homitt 2-Way connector is the only product reviewed today that is not made of brass. It is instead made of a zinc alloy with a rubberized coating. This material choice is generally considered inferior to all brass construction, though frankly many have found that the zink is just as good as brass, and the Homitt garners much positive feedback from sites like Amazon. This splitter does have a fairly ergonomic design, in part due to its material choice. The main faucet attachment is easy to screw on, as it has a rubberized coating. The levers are larger than the others we reviewed, and some who have impaired motion in their hands found this design to be a distinct advantage. The main problem with the Homitt splitter is durability. Although it operates well, it doesn’t quite hold up to long-term abuse. “Abuse”, in this instance, means anything that puts a strain on the splitter. If one jerks the hose too hard, or leaves the water on and the splitter shut off, they are likely to have breakage and leaks. With that said, it does come with a one-year warranty, which is always a plus. The plastic seems to be the weakest part of the design, with most negative comments coming in about how it breaks easily. There were also complaints about poor threading on the connectors, making it impossible to get a good seal. Overall, this garden hose splitter is a decent choice, with perhaps poorer materials quality than other garden hose splitters, but perhaps slightly better ergonomic design than most. If you’re one who struggles to manipulate small levers and controls, the Homitt may be a great option, even though it might break a little sooner than other garden hose splitters. Durable and Recyclable: The hose splitter is made of high quality zinc alloy and plastic with comfortable rubberized grip. Never worry that the hose splitter 2 way will be rusted. 2 Way Y Hose Splitter: The garden hose splitter has 2 Way connectors and 2 valves. After using the water splitter, it easily converts 1 spigot into 2 high flow water sources. It can make your garden life easier. Correct Size: The size of connector is 3/4" (US standard); our faucet splitter can match any American spigot. two way hose splitter can support 0.8Mpa water press.Choosing Homitt garden hose splitter 2 way, you will never worry about the wrong size for your faucet. Easy for Installation: Only rotating the connector when hose splitter connects with your faucet. No tool needed. Warranty: Every Homitt product enjoys a 12-month worry-free guarantee & 60 days money back Guarantee. The A1005 is a basic workhorse product from Sommerland that is made from solid brass. It comes with 10 extra rubber hose washers, and these are always helpful to have around. This splitter is sturdy and will not break off with hose movement, even if it is being tugged on somewhat. The levers that control the water flow for each hose outlet are easy to operate and don’t seem to get too stiff. Some users might find that they are a little hard to push open and close in tight quarters. As you can see, the valve controls are on the small side. The Sommerland A1005 is cast brass in one piece. The only drawback that was noted for this was that there were sometimes some rather sharp edges from the mold – sharp enough to need filing down. Check yours to ensure there’s nothing dangerous there, and if there’s anything sharp on the body, file it down or send it back for another one. Consistency in the manufacturing process seems to be an issue. Users either received a good product that worked well with normal use, or one that had casting faults. The Sommerland A1005 holds up really well to normal use, and its durability and functionality are both solid. It is covered under a 3-year warranty, and includes plenty of extra rubber gaskets. All of these features brought us to choose this as our top pick among garden hose splitters. The Morvat Heavy Duty Brass Garden Hose Y-Adaptor is also a solid brass product – even the ball valves – and it weighs more than similarly sized 2-outlet converters, showing that it’s heavy duty. However, high-quality construction is unfortunately coupled with a few questionable design choices. The Morvat metal looks good out of the box. The threads are crisp, the molding is well -finished, with no customer complaints about rough edges or bad connections. It comes with 10 extra washers in the package. All of this is good. The problem comes with the design of the levers. Many find the Morvat’s levers are a bit small and awkward. They have a tendency to get stuck, and more than one reviewer mentioned having to use a hammer or pliers to move the stiff little levers to open or close the water flow. Some have also had issues connecting it to the main faucet. Some reported that although the ball valves worked well, and the unit didn’t leak or break at the two hose connectors, there were complaints about the weld at the main connector breaking off or failing. Other than these issues, the unit is fairly well-regarded and seems to perform well. It handles water pressure pretty well, and holds up well to the stresses of hoses being pulled back and forth. The Morvat is well built, but can be difficult to use, with challenging valve controls. IMPROVED FOR 2019: This splitter has been updated and redesigned for 2019. The top connection is now stronger than ever, built to last and never break. The handles are also much easier to grip and turn! The Morvat hose connector is back and better than ever! NO MORE HASSLE: Instantly create two tap outlets with this ultra-durable hose splitter 2 way connector and eliminate the stress of constantly switching out hoses. 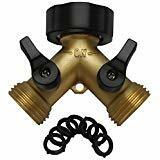 The adjustable flow control makes it easy to use this faucet splitter as a garden hose pressure regulator by simply adjusting the brass levers, giving you the perfect flow for watering plants, washing your car, or cleaning the siding. HEAVY DUTY BRASS: The all-brass construction of the Morvat Y connector hose attachment ensures superior durability to withstand high pressure and all weather conditions without breaking, rusting, or failing. KEEPS LEAKS AT BAY: Fitted with high quality ball valves for water tight shutoff and featuring great threading for a solid connection, this garden hose splitter effectively prevents any leaks or drips. SIMPLE TO INSTALL: Our brass hose splitter is designed to easily accommodate all standard hoses, with the main connector creating a tight seal on water outlets with either metal or plastic threading. Sommerland has a wide line of solid brass garden products, and the A1007 is yet another quality solid-brass hose adaptor. This particular splitter was our favorite four-way garden hose splitter. It handles four outputs while still coming in at a good price point. Most gardeners will likely not need four hose outputs at once, but why not have the extra outlets available? It’s nice to be able to keep your sprinklers running when you need to fill up a watering can or water some potted plants, and a four-way system is ideal for those who plan to move into DIY irrigation systems, or who use a network of soaker hoses. The A1007 works well under normal usage. It has a fairly flat profile considering all the hoses it is capable of handling and is designed well. The outer two hose attachments are slightly spread out from the two center spots, making it much easier to add and remove hoses. It comes with 10 extra washers, which you may burn through pretty quickly if you are regularly using all four valve outputs. The durability of this hose splitter is good and is covered under a 3-year warranty, which is always a help. Some users reported that the levers needed tightening or readjusting over time. Like all garden products, these should not be left out and allowed to have water freeze in the unit. Like the Morvat above, the levers that adjust the water flow for each outlet are small. Some may find them to be difficult to manipulate. This is somewhat obviated by the way the outlets are spread out from each other, but the levers can be awkward for anyone with impaired mobility in their hands. Overall, the A1007 provides a lot of versatility for the price, and the four outputs are super useful for some users. The Somerland provides a solid guarantee that will replace or refund any units with problems. It is the best choice for those who are looking for four garden hose outputs. The Ipow 2-way valve has a funny name. But works well, is well designed, and was our Top Choice of all the hose splitters we reviewed, so you can ignore the name! This unit has solid brass construction and is heavy and well-made. The general consensus is that it is quite rugged and that it holds up well with regular use. The size and shape of the main faucet attachment is particularly well-liked. It’s covered with a rubberized grip that makes it easy to grip and turn. Since this is the primary attachment to the water source, it’s particularly important to be able to grasp it securely and tighten it firmly without issues. The levers that operate the water flow to each outlet are adequate. They are also rubberized and fairly easy to grip. These work smoothly and control the flow well. Some feel that the levers could be longer, as moving them to the completely open position brings the lever quite close to the main faucet connection. The Ipow has few reported problems with leaks and breakage, bad threads, or breakage. And any reported issues are dealt with rapidly by Ipow’s customer service. They are quick at offering fast product replacement and trying to make things right, which is always a good thing! The biggest issues users typically find are a bit of awkwardness of the lever movement, and occasional issues with seating the attachments on the faucet spigot. Overall, the Ipow is a high quality, user-friendly two-outlet splitter that performs well, and is backed by a 100% risk-free guarantee by its manufacturer. This is a great choice for a garden hose splitter and should be your first stop when you’re shopping. 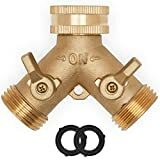 FITS ALL STANDARD FAUCET AND GARDEN HOSES - Easy turn swivel connector on hose adapter attaches quickly to standard spigot or hose connection. Connects to the spigot easily with the wide black grip. No wrench or pliers needed. SOLID BRASS FOR LONG USE WITHOUT LEAKAGE OR CORROSION - Heavy-duty and eco-friendly solid brass construction make the hose connector support up to 0.8MPa water pressure without leakage and last from season to season without rust. Extra 7 rubber washers included to prevent the hose connector from leaking. SPLIT 1 SPIGOT INTO 2 WATER SOURCES AND MORE - Run 2 hoses from the same water spigot with one hose splitter, and you can even connect more hoses to your backyard sink, drip irrigation, sprinkler timer system, hose end tap timer with more hose splitter. Made for home, garden and backyard use. EASY-TO-TURN INDIVIDUAL VALVES & COMFORTABLE GRIP - Covered with thermoplastic rubber for easy grip and operation, the valves allow you to control the water flow separately and easily without going back and forth to the source. 100% SATISFACTION GUARANTEE - With IPOW Hose Splitter, easily handle watering plants, showering pets, washing car, cleaning house and more situations without switching hoses frequently; This hose splitter enjoys a 12-month worry-free guarantee & 60 days money back Guarantee, now move your finger and click "Add to Cart"! A good hose splitter should be sturdy, durable, able to handle water pressure without leaks, and be easy to operate. Most models come in brass, though we reviewed both brass and zinc alloy metal blends and rubberized zinc does have its fans. We paid careful attention to the operation of the levers that control the water flow for each hose outlet. A good splitter should move easily, not jam or get stiff, and should be easy to move without requiring extra tools like pliers. Our budget choice, the, Sommerland A1001, provides a sturdy, solid cast diverter with two outlets and pleasing durability, although it does have some occasional issues with sharp edges from the mold casting. Our 4-way choice, the Sommerland A1007 provides a lot of outputs and a decent build-out. Its solid brass construction and low-profile design came with a good price, durable operation, and a solid guarantee. And finally our top choice, the Ipow 2-Way Brass Backyard Valve, combined sturdiness, ergonomic design, and durability. It is well-priced and comes with an excellent 100% Satisfaction Guarantee from the manufacturer. It should provide reliable service for basically any type of garden use.